101inks, online at 101inks.com, carries the highest quality inks at low prices. 101inks offers printer supplies for all brands, including Dell, Epson, Canon, HP, Xerox, Brother, Lexmark, Apple, and Kodak. Save on printer ink and toner when you buy with 101inks. 101inks specializes in remanufactured inkjet cartridges and laser toners. Simply select the model of your printer and find the cartridge you need. For 101inks coupons, 101inks discounts, and 101inks promo codes, see RetailSteal.com. 101inks offers free shipping on all orders over $55, and ships within the US only. Make return within 180 days of purchase for refund. See website for full details, exclusions may apply. Use this coupon code on 101inks to get 15% savings on your order. Visit 101inks and use our exclusive coupon code to receive 10% savings and free shipping on any order $55 or over. Shop at 101inks and enjoy free shipping on all $55+ orders in the US. Click the link to start saving. 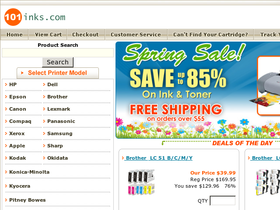 Shop at 101inks to get printer ink and toner for up to 85% off. Save on top brands including HP, Dell, Brother, Canon, Lexmark, and more.